Charles L. Bowers School Farm was purchased in the mid-1960's by Bloomfield Hills Schools to be used as a land laboratory. We are housed on 90 acres within Bloomfield Hills. Animals such as sheep, horses, llama and a donkey graze the pastures. We also house poultry of all types, rabbits and goats. Every animal has a purpose here at the farm and farm equipment is used daily to maintain the property as an educational agriculture production enterprise. Charles L. Bowers Farm is open daily and year-round for various educational programs and community events. Bowers School Farm is a proud partner of Michigan State University Extension. The latest research-based curriculum and experiential methodology inform the instructional design of our hands-on school and community programs. Focusing on the process of science, educators from MSU enhance the unique learning experiences, activities and hands-on workshops at the farm. These experiences give students the opportunity to understand the interconnectedness between science, food, and our natural world. Want to Visit Bowers Farm? 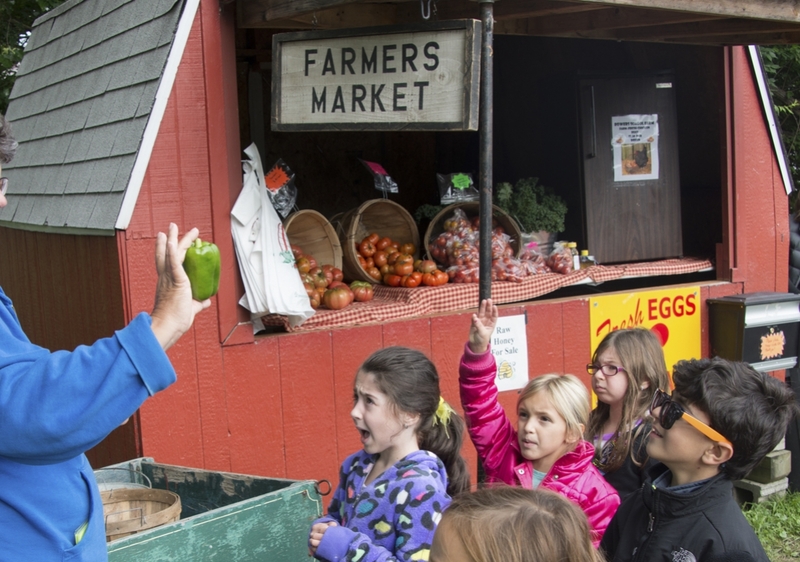 The farm offers educational field trips for schools interested in enhancing the classroom learning experience through authentic, place-based learning. Community organizations such as scouts, neighborhood associations, family and church groups can also sign-up to participate. Program topics include Plant Science, Animal Behavior, Sustainability, Harvesting, Conservation and Genetics to name a few. Programs with specific topics run at different times of the school year, range in duration and price and target different ages/groups. If you prefer a more casual visit to Bowers Farm, we invite you to take a one-hour guided tour! Tours are scheduled in advance to allow for customized experiences for individuals and groups of virtually any size. Our Farm tour & wagon ride is an hour long and we ask for a minimum of 5 people. The cost is $10/person. We can still provide a tour & wagon ride for groups of less than 5, however the cost will then be a flat-fee of $50. If you'd like to schedule an educational program or a one-hour tour, please complete the online form or call us at 248.341.6475. Every year we host a fun-filled "Spring Fling & Pancake Breakfast" and a "Fall Festival" community event! Visit the Farm Programs & Events page for details. A seasonal farm stand that is stocked with fresh veggies and eggs from our gardens and hens at Bowers Farm! Room and Area Rentals - we are also pleased to rent areas of our facility to those looking to host a birthday party, wedding or baby shower and even have their wedding take place in our lovely gardens maintained by the MSU Master Gardeners! Visit the Farm Programs & Events page for additional information or feel free to call 248.341.6475. Want to try out cooking with fresh produce? What about swinging a hammer to make a birdhouse? Ever tried keeping the dye from washing out of a freshly tie dye shirt? Spend your summer mentoring kids and helping them move through the camp day trying out fun and engaging activities! Look, you'll be headed to college soon. Do something different this summer! Stewards are 15-19 years of age and are assistants to the camp leadership and role models for camper. Stewards develop a deep understanding and knowledge of the farm and our camp program. This experience is both fun and meaningful as Stewards develop skills which enhance their career and academic readiness. Here is a glimpse of some of the fun from last year. Are you looking for something farm-tastic for your kids to do this summer? It is still not too late to sign up for our summer camp programs. We offer everything from our Barnyard Buddies preschool program to our specialized Vet Science camp for our future veterinarians. Go online today to register through community pass. We look forward to seeing you at camp this summer! Springtime on the farm is a great opportunity to bring your school or class out for a visit. Discover plant science in the gardens, visit the new baby animals, and take a wagon ride across the back forty! Exploring science hands-on is a great way to build excitement and cap off a wonderful school year. Visit www.bloomfield.org/farm or call Jackie today, 248-341-6475. Our 3rd graders have been exploring how Bowers Farm is still growing today, over 100 years after its first settlers. They helped measure our baby goats to ensure they were growing strong and healthy. After, they measured to help ensure our chickens were laying quality eggs and observed healthy animal behaviors. Students were also able to walk out to our garden to assess its "readiness" for Spring planting by testing moisture, pH levels, and temperature. Many students worked hard by helping us pull old plants and walkway liners out in preparation for tilling our soil and new planting. Finally, the third graders moved inside to gain a better understanding of seed growth and how our planting begins in the greenhouse. It has been a great program to help us launch Spring on the farm! Bowers Farm is seeking volunteers to help get the grounds Spring-ready! On Saturday, May 4, 2019, from 9 a.m. - 1 p.m. at the farm volunteers will gather for farm clean-up, weeding, fencing, painting, and more. If you'd like to help out, register to volunteer here. On Saturday, May 11, Bowers School Farm will host their annual Spring Fling Pancake Breakfast event from 9 a.m. - 2 p.m. This will be a time for visitors to come to the farm and enjoy a variety of experiences, including a yummy pancake breakfast, open barns, craft making, and fun farm exhibits. Tickets can be purchased at www.bloomfield.org/spring. Sign-up early to get your preferred seating time, and enjoy all the farm has to offer! Interested in a class at Bowers Farm? Register Here! Read more about Register Here for Classes! between 8:00 a.m. - 2:00 p.m.
Bowers Farm is open daily for visits that are booked in advance. Walk-ins are allowed for designated community events only (see Fall Festival information). Want to book a visit to the farm? Take a guided tour! Please complete this online form or call 248.341.6481.